While school is still well over a month away here in my neck of the woods summer is slowly winding down and before we know it we will be headed back to school. I still have a month before my youngest starts kindergarten and I thought it would be fun to create something special for all the little ones that are heading back-to-school this week (and those that are celebrating their first day of school). 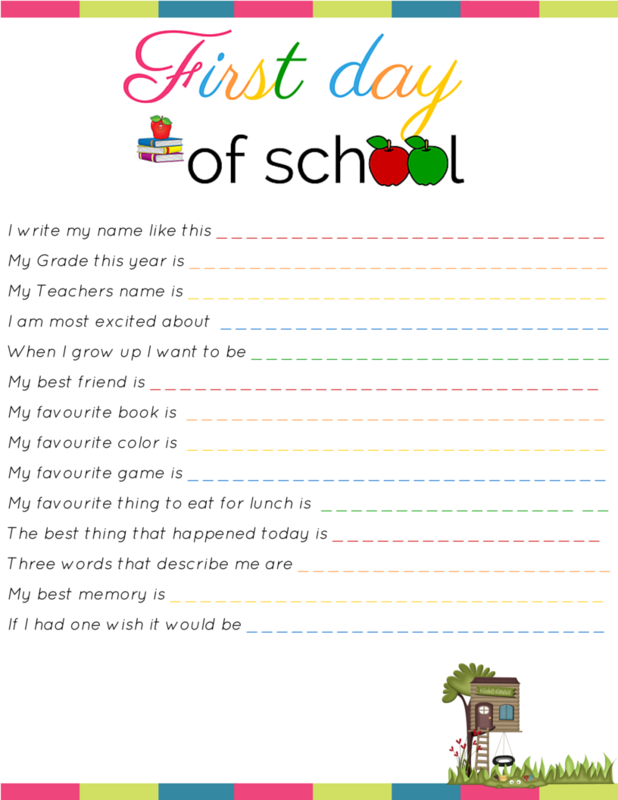 This little printable is a perfect way to remember what your kids loved most, and what they thought about the first day of school with these interview Questions for Kids. Change is subtle sometimes that we miss it so this is a perfect place to start. I wish I had done this with my oldest, she changed so much throughout the years it would have been fun to look back on just how much she changed! I thought it would be fun to have the kids fill out the interview on the first day of school and then we could compare answers (and handwriting) on the last day of school. I’ve created a Back to School interview Printable which you can download for free. Click HERE to download. I confess…. we are so not ready for school to start but, I have a little more time before I too will be scratching my head trying to plan a peanut free/healthy lunch for three little ones. Especially for the little one that lives on Nutella. She is going to be heartbroken when she learns Nutella is a no go. I hope you enjoy this little printable and I promise.. while you’re busy sharpening a million pencils crayons and trying to figure out what to pack in your little one’s lunch bag we will enjoy these last few weeks of sunshine. Aww adorable and super cute. It would be interesting to read it and see if their answer remains the same at the end of the year. This is so cute. I’ve done similar things with kids in school on the first day but I never thought about applying it at home too! Great idea! Hard to believe it’s almost that time. This is too cute! I absolutely love this idea – printing! Thanks for the free printable. I’m going to start this tradition with my kids this year! Thanks – I just printed it. My lil guy starts school for the first time, so this should be helpful. That’s so sweet! It would make an adorable keepsake with a photo from the first day of school. Super cute! I pinned this and can’t wait to use it for my kids! Thanks for sharing! This is so cute and I will have to use for my kids for their back to school….the first day of school interview. This is so cute! Printing for my son! This looks great! I wish I had a working printer, so that I can do this with my older two kids. This is such a great idea. Definitely something to save. I love this! My girls are a little older – but it would be fun to do anyway. We have less than 2 weeks until school starts – and we all cant wait!! This is great! My kids go back next week so I’ll have print one of these out. What a wonderful idea, and a great tradition that can be kept every single year between all of the kids! Love it! School starts the end of July here. Luckily I homeschool and can start later if I like. It just seems like summer is way too short! This is such a cute idea. My baby starts preschool this year! It would be fun to see what her answers are. What a great printable. My kids go back to school in a week, super early for us here in the West. Love this! What a great idea! I will for sure be printing this out. I love printables! Such a fun idea! I wish I had started doing this when I was homeschooling my oldest. I would have lots of great interviews for our memory boxes. When I have kids this is exactly what I am going to do what great ideas thank you for sharing! This is so cute. I bet kids love answering these nice questions. it is fast approaching isn’t it – I know before I know it the first day will be here and I will be so unprepared! How cute is this?!? I need to remember this for when I have kids! This is such a great idea! I will have to do this with my children! Is it really that close to back to school? This year is flying. What a cute idea and a fun way to get kids motivated. This might have worked so much better for me with my son! I’d ask him, he would have a one word answer! Great idea!!! What a great way to start off the school year. I really like the idea of comparing their answers when school gets out. I can’t wait to do this! I love asking my kids these sorts of questions, as you just never know what sort of answers they will come up with! My daughter will be starting a new school for this September as a senior. I am totally having her fill this out! What a cute idea. This is awesome. Great idea for first day. What a cute idea! I need to print this off for my kids. Love the colors! I’m so glad to hear that you downloaded it! I sure hope you enjoy your little ones answers, I have to wait a month before my kids go back to school. I can’t wait to read what they write. Aw what a cute printable for first day of school. So adorable. I can’t believe school start up is two and a half weeks away! What a great idea! I love the interview questions! We still have a month before school starts, but I want to be ready. Our Grandkids are starting school early this year. I think they are starting early so they can let the kids out in May instead of June. The printable interview is a cute way to remember what went on. Mine go back soon too. Way way way too soon. This summer flew by, and I’m definitely not ready. What a cute idea. I love this & totally want to do it with my kiddos.